Pupils from Greet Primary School in Birmingham took in a pioneering East meets West-style children’s choir, the first of its kind, ever, as part of a drive to reinforce British Values. Around 120 Year 5 pupils showcased on stage last Friday a series of songs in Sanskrit, the ancient language, including one similar to the National Anthem of the United Kingdom, ‘God Save The Queen’. The British Carnatic Youth Choir is the brainchild of Dr Chithra Ramakrishnan, one of UK’s finest Carnatic vocalists. Her mission is to raise awareness of this: ‘mutual respect for and tolerance of those with different faiths and beliefs and for those without faith’, one of four fundamental British Values, according to schools watchdog Ofsted. Almost all pupils at Greet Primary School speak English as an additional language. Pat Smart, Headteacher at the “Outstanding” Greet Primary School said: “Equality of Opportunity is at the heart of everything we do at Greet Primary School. We are delighted to have been offered the chance to participate in the British Carnatic Youth Choir, an exciting and inclusive experience for us all.” The British Carnatic Choir, or BCC, a new initiative of Shruthi UK, a Midland-based South Asian arts and culture organisation, aims to create and explore choral singing in South Indian classical music in the UK and aims to identify and recognise people, particularly children and youth, of all abilities and from all walks of life who share a common passion to create a British Carnatic Community, one which reflects the multicultural mosaic of Great Britain. It is Dr Ramakrishnan’s mission to complement Prime Minister David Cameron’s British Values in an attempt to encourage all citizens, but particularly our future generations, to respect each other’s ways of life and to celebrate good work, through the sounds, words and pictures of the British Carnatic Choir. On Saturday, a follow-up concert marked the 10th anniversary of Shruthi UK. Held at the Birmingham Conservatoire, the event brought together around 100 people. Distinguished guests included Paul Sabapathy, former Chairman of Birmingham City University, High Sheriff of the West Midlands Jonnie Turpie and his partner Marian, Deputy Lord Lieutenant of the West Midlands Satinder Kaur Taunque and her husband Jagjit Singh Taunque, Mayor of Solihull Cllr Glenis Slater , Mr BC Pradhan from the Indian High Commission, Cllr Ramesh Srivastava, former Mayor of Rugby, Beverly Lindsay OBE and our senior news editor Dhiren Katwa. Dhiren told the audience it was impressive to see British-born youngsters proud of their rich Indian culture and heritage, symbolised by their costumes, language and instruments. Likewise, he said it was pleasing to see the willingness of English staff from Birmingham City University to learn Carnatic music and the Indian way of life. The vibrant and colourful evening, compered beautifully by Mini Mohan, a senior IT specialist in the NHS, featured Bharatnatyam dances and a series of songs performed by a unisex group of 38. 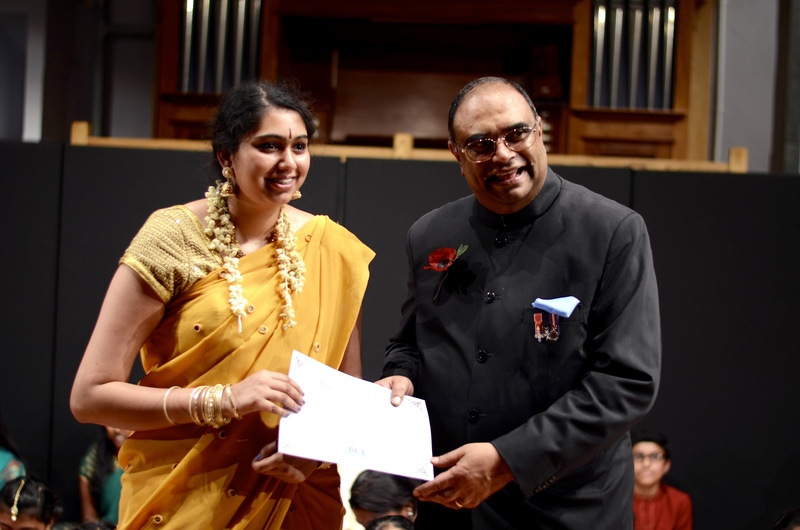 Dr Ramakrishnan’s daughter Shruthi, who was part of the performance, as was her brother, was praised for creating and managing her mum’s website. Aged 14, Shruthi attends King Edwards Girls Grammar School in Handsworth and aspires to be a dentist or architect. Carnatic music is a system of classical music associated with the southern part of the Indian subcontinent. The violin was introduced into Carnatic music by Baluswami Dikshitar, the younger brother of Muthuswami Dikshitar, a South Asian poet and composer (1775 – 1835). He encountered the instrument through British bands in colonial Madras, and decided to learn it.